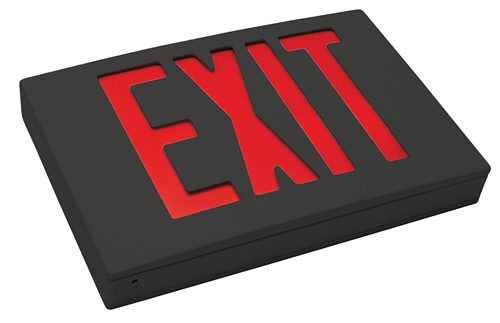 Take advantage of a New York Approved Exit Sign made of sleek black powder coated aluminum. LED lighting and design offers the ultimate energy-saving, city compliant solution. • Includes the contemporary black-on-black, die-cast aluminum that matches with any décor and complies with New York city code. • High-grade, high-output LEDs save hundreds of dollars on energy, while this durable cast aluminum body offers a long-lasting design. • Sleek, pop out chevrons included to show direction to nearest exit. • Self-Diagnostic capabilities are available with a battery backup option; attractive black-on-black is one of our most popular options. • Sign weighs 6 pounds. Add 2.6 pounds for double-sided version and .4 pounds for SDT option. • Also available in powder coated white or brushed aluminum finish. NYDXR New York Emergency Lighting. 6 volts 18 watts with 2 Heads.